A/C Delete Pulley kit. If you have an all out race car, or trying to save alot of weight here is a big peice of the puzzle. 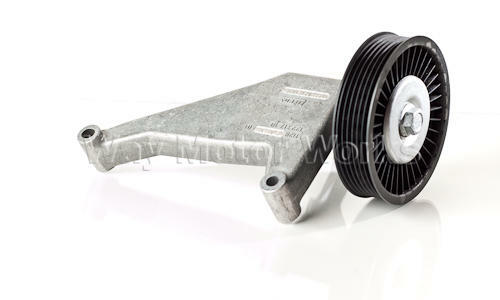 This A/C delete idler pulley with bracket is a direct replacement for your A/C compressor. The stock air conditioning compressor weights 20+lbs. This pulley will allow you to keep the current belt and reliability that you currently have. There is absolutely NO modification needed to install this, just remove the stock A/C compressor. This is also a good alternative to replacing the expensive compressor if you can live without the A/C. Includes Pulley with bracket as shown in picture.